Generally, pickled wasabi is most often prepared with finely-chopped and salt-pickled wasabi roots and stalks, which are then mixed in aged sake lees with salt, sugar and other ingredients. 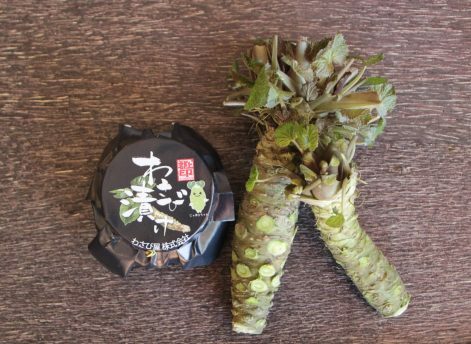 But the pickled wasabi made in the Wara area in Gujo City is different; it is prepared by first salting wasabi plants, washing them with boiling water and pickling them in soy sauce with dashi or sanbaizu, a mixture of vinegar, soy source and sugar or mirin. Furthermore, they are pickled for two to three days to further bring out the spiciness of the wasabi. ＜Messages from the Staff＞ We are very particular about the ingredients and taste.Spicy, but delicious wasabi.Try them, and enjoy. The wasabi plants are grown at the stalactite cave renowned for the legend of the dragon god, "Jaana". Once you exit from Gujo Hachiman I.C., the large signage of "Wasabiya" will catch your eye. There is a wide range of products including miso, nori, salt, chazuke, etc. using wasabi. The store has a tatami room, and operates as a cafe as well.